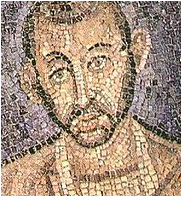 Tertullian was an influential theologian and apologist from Carthage, North Africa. He is widely considered the "father" of western (Latin) theology. Click here to read his reflections on who the prodigal son is--backslidden believer, Jew, or unbeliever--in On Modesty VIII. Ambrose was a popular imperial governor when he was acclaimed bishop by the people of Milan. He became an seminal theologian in the 4th century and was a formative influence on Augustine. Click here to read his meditation on the three "Lost" parables. John Chrysostom was a great theologian, preacher, and leader of the early church in Antioch and Constantinople. His reflection on the parable focuses on the power of repentance. Click here to read a selection about the parable of the prodigal son from Exhortation to Theodore after His Fall: Letter 1 (4th century). Cyril, having availed himself of an education in the humanities and in theology, was named Patriarch of Alexandria, from which he asserted his influence in the Trinitarian and Christological controversies of the day. Click here to read a thoughtful reflection on both sons.